TO CHEW ON: "Jesus spoke these words, lifted up His eyes to heaven and said: 'Father the hour has come. Glorify Your Son that Your Son also may glorify You.'" John 17:1. Someone has suggested that John 17, our passage today, should be called the Lord's Prayer more than Matthew 6:9-13. If the contents of a person's prayer are an indication of their preoccupations, we can tell a lot about the things Jesus was interested in, that were at the very heart of His thoughts, by these verses. 1. He prayed that He would be glorified (John 17:1-5). But, we ask, isn't that self-serving? And then we realize who is making the request, and of whom. He is the God the Son, praying to God the Father who is the sum-total of all that is right, true, beautiful, glorious, excellent... Where else should glory go if not to Him? 2. 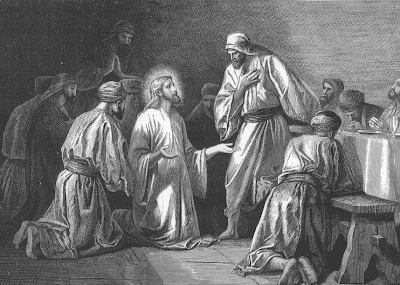 He prayed that the apostles would be sanctified (John 17:6-19). In His prayer, Jesus gives us a glimpse of how special and unique these men were as gifts to Him from God the Father (John 17:6-7). He prayed that God would keep them, and specifically, keep them from the "evil one" (John 17:11-12;14-15). He asked that they experience His joy (John 17:13). And He requested that they be sanctified or set apart to take the Gospel — good news about Him and salvation — to the world (John 17:17-19). 3. He prayed the the church would be unified (John 17:20-26). We are included in this prayer as those "who will believe in Me through their word" - vs. 20. Jesus' great desire is that we experience and demonstrate unity. Our unity will be a sign to the world so they believe God sent Jesus (vs. 21). And this unity will eventually flower into His followers joining Him to "be with Me where I am..." (vs. 24). "For we are God's own handiwork, His workmanship, recreated in Christ Jesus, born anew that we may do those good works which God predestined, planned before hand for us, taking paths which He prepared ahead of time — living the good life which He pre-arranged and made ready for us to live" - Ephesians 2:10 AMP. Do we set ourselves apart for such a God-appointed destiny? And are we working toward unity? Or are we standoffish from other Christians, choosing to focus on our differences rather than the core Gospel truths that unite us? PRAYER: Dear Jesus, thank You for this prayer, straight from Your heart. Help me to answer it in my life today. Amen.